Approximately eighty manuscripts survive as posterior records of the famous carnival parade (Schembartlauf) held on Shrove Tuesday in Nuremberg from 1449 to 1539. Most of the existing manuscripts include marvelous full-page illustrations of participants from the families who, year by year, sponsored the parade, and a few include depictions of the floats. The present remarkable volume in its original binding is not only one of the earliest extant copies but also one of the few to include drawings of the floats. It was customized for its early (and possibly first) owners, the members of the influential patrician family of Kress von Kressenstain in Nuremberg. ii+88 leaves, complete (collation 2+i50, ii20 (16+1+2+1), iii18 (the third gathering is a very complicated quire with four intermediary threads, added leaves and stubs, but it is complete and apparently original in this state, as the first and the last leaf form one bifolio)), 2 flyleaves at front, written on paper of various origins in light brown and black ink by a number of different German cursive hands (one major hand in the first gathering which continues in the second, second hand from ff. 67 (66)-71(70), from f. 72(71) on, four different hands) in one column of varying lengths, modern pencil foliation in upper right, skipping one leaf after f. 17, no ruling, no decoration or other enhancement of script. The watermarks in the first and second gathering mainly from one source (a bear, turned 90°, with collar and tongue poking out, with claws, not recorded in Piccard or Wasserzeichen online database; also a castle or fortress and another bear, none of them identifiable) whereas the watermarks in the third quire are quite mixed: also the bear, but moreover two kinds of coats of arms with crowns, one of them (ff. 86(85)-88(87)) only remotely similar to DE5040-PO-24548 (1648 Speyer), yet so far unidentifiable , however, the two front flyleaves bear the same watermark as ff. 80-82 and 68 and 70, 64 full-figure pen and ink drawings in very fine condition, colored with washes, some details in gold and silver leaf, 22 smaller pen and ink drawings, probably added only slightly later, paper quite strong in varying stages of darkening, thin and thumbed towards the margins, especially in the third gathering, minor stains and spots throughout, some offsets of the washes of the drawings, green hues coloring the ground and some of the costumes often shine through, very few minor tears, no restoration. Contemporary limp vellum binding with flap, loose in binding, lacking fore-edge ties, splits at head and foot of flap fold, inscribed on spine “Schempart Buech.” Dimensions 310 x 205 mm. 1. Made in Nurmeberg c. 1540-1550, based on the style of the drawings (we are grateful to Fritz Koreny for his expertise). Ex-libris of Iohannes Guilhelmus Kress à Kressenstain dated 1619, an engraved plate with his coat of arms and additional crests of related families (Schweikhart, Haller, Kress, Freidel) glued to front first flyleaf. The Kress family, which in 1530 was permitted to add the title “von Kressenstein” to their name, was one of the major patrician families in Nuremberg. It is quite possible that the present manuscript was made and/or acquired for the Kress family. Members of the family participated in the Schembartlauf (Schembart pageant or carnival) and are recorded here with their masks, names and coats of arms (see below). 2. Letters “MCP” written in lower corner of f. 1. It is not certain whether this is an ownership entry, which remains to be identified. 5. Paul and Marianne Gourary (1919-2007 and 1920-1914, respectively), New York, Collection of Illustrated Fête Books, their bookplate underneath the Kressenstein label; Christie’s New York, Splendid Ceremonies the Paul and Marianne Gourary Collection of Illustrated Fête Books, June 6, 2009, lot 309.
ff. 1-66(65 pencil foliation), individual records for all 64 Schembart carnivals from 1449-1539 on double-page openings with illustration on verso and text on the facing recto: f. 2, incipit, “Anno 1449 Dar ist ein Schempartlauf gehalten Inn dem was Cuntz Eschenlörer Hauptmann ...” (In 1449 there was a Schembart Carnival, and Cuntz Eschenlörer was its captain, the lead figure); f. 45(44), a list with names of all participants, of all men accompanying the captain in the Schembart Lauf of 1503, among them also a member of the Kress family; f. 59(58): a list with names of all accompanying men and a more exhaustive report on the 1518 Schembart; f. 65(64) lists the carnivals from 1524-1532; f. 65, explicit, “… Anno 1532 Zug Kaiser Carollus mit einem grossen Volck dergleichen bey menschen gedencknus nit erhört ward, In Osterreich dem Turcken zu wehrenn vnnd schlug ein grosse Summa derselben todt mer dann 15000 der straiffenndenn Rott” (In 1532 emperor Charles moved towards Austria with a big army the numbers of which was never heard of before in order to defeat the Turks; he killed a vast number of them, more than 15000 of the wandering troops); ff. 67(66)-68v (67v), extended account of the riotous carnival of 1507 on an added bifolium incipit, “Anno Domini 1507 In disem Jar was Haubtmann ... Die Schichte (?) hab ich alle vor 48 Jaren in meine Schempart Buech also eingeschrieben unnd ytze hierher verzeichnet das ich aygentlich gewiß pin das nicht Sigmund Fuerer wie andre Schempart buecher anzaygen Hauptman gewesen sey im 1507 sonder Sigmund Pfinzing zum Marolfstain(? )” (I noted this story 48 years ago in my Schembart Books and now copied it here, so that I am quite certain that in 1507 it was not Sigmund Fuerer who was the captain, as stated in other Schembart Books, but Sigmund Pfinzing of Marolstein); This text confirms that this account, along with the sections of the text continuing to f. 71v which were written by the same hand, must have been written or added in 1555 or later (i.e. 48 years after 1507); it also tells us that this note was written by someone who copied or contributed to other Schembart manuscripts as well. ff. 85v(84v)-88v(87v) blank, probably additional space for further entries which have never been added. 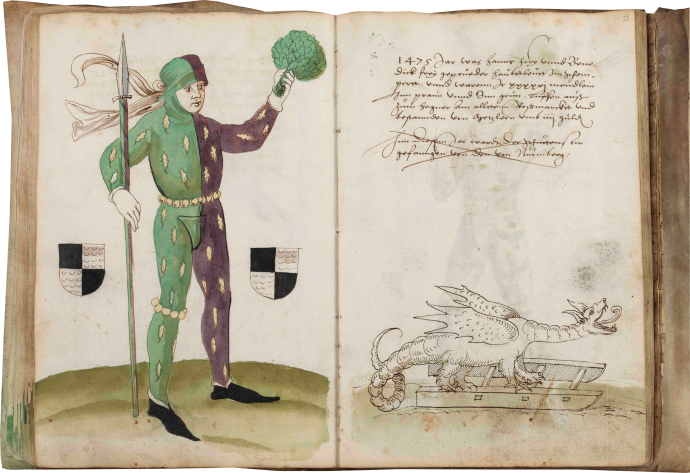 The text of this beautifully preserved manuscript is a record or chronicle of the so-called Schembartlauf, a carnival parade, in Nuremberg, as it was held each Shrove Tuesday from 1449 to 1539. The short texts accompany full-page illustrations of the colorful and eccentric costumes worn by the captains of the pageant of each year. The text relates to the year in which the carnival had taken place and also signals those few years where it did not occur due to unrest or the plague; included is the name of the captain, the number of men who accompanied him, sometimes a short description of the costume, and sometimes the route of the pageant in Nuremberg. The last 18 leaves that are not illustrated were added to the manuscript as a complimentary record. They contain another textual version of the account of events, and also include the legendary narrative of how the Schembartlauf was first instated in Nuremberg. According to this narrative, the parade originated in 1349 as a privilege granted by Emperor Charles IV to the butchers’s guild of Nuremberg. The trade guilds of the city had risen up in the previous year, overthrown and replaced the patrician town council. Their new council survived for almost a year, and then Charles IV acted against them; he reinstated the original regime, had their usurpers executed and their new building torn down. To reward the butchers’s guild for not participating in the revolt, Charles IV granted them the right to a special public celebration on Fassnacht. They could wear masks–a rough translation of Schembart (which literally means “hiding beard”)–, dance, perform fencing matches, and parade. The dancers were protected by the so-called Läufer (the runners), whose own performance gradually came to be the main event. They wore not only masks, as can be clearly seen in the illustrations, but newly designed and extravagant costumes, richly decorated with embroidery and ribbons, and bells that jingled as they ran through the streets. They brandished lances and held boughs of leaves that look like artichokes–known as Lebensrute–that concealed fireworks (as can be seen on f. 64v). Eventually, fireworks were outlawed during the carnival because they caused so many fire hazards in the city. From 1475 onwards the pageants were also accompanied by floats, called Hölle (Hells), twenty-two of which are represented as pen and ink drawings in this manuscript, probably added slightly after the other illustrations were completed. The earliest floats were mounted on sledges, and later they were on wagons with wheels. Twice an actual elephant paraded with the carnival figures, as reflected in the drawings of the floats (ff. 43v, 63v). The last Schembartlauf was held in 1539, when it had become so riotous that authorities prohibited it for years to come. That year, the accompanying float presented a Ship of Fools with the Lutheran minister Osiander, who was holding a backgammon board and was surrounded by fools and devils (f. 63v). The Protestant movement had been prominent in Nuremberg from quite early on, and it is easily imaginable that the nobility, the members of the city council, and the clergy were offended by this display of overt satire. Corrections and additions to this text were apparently added only slightly later. For example, the first hand on f. 2 simply notes that in 1450 there was no “Schempartlauf,” while a second hand explains why. Similarly, many corrections or modifications seem to have been added after other “witnesses,” either living or recorded, of the Schembart carnivals had been consulted. In fact, it appears that the early owner of the manuscript was keen to possess a record of the history of the Schembart carnival that was as historically reliable as possible, modifying the text and making additions as new “evidence” came to light. Many paragraphs in the first section are crossed out, presumably because they were rendered superfluous by the more extensive additional reports at the end of the manuscript. The second record of the Schembartlauff found in our manuscript beginning on f. 74 (73) is identical to the text that accompanies the illustrations in one of the Merkel manuscripts in Nuremberg (Germanisches Nationalmuseum, Merkel HS 2°241, from f. XXIXr). Thus, there must have been at least two sources the scribes copied from. The present manuscript does not, however, contain the lengthy rhymed prologue as it is found in a copy at the Getty Research Library. There are other extant copies with the same textual redaction as our manuscript, which suggests that the manuscripts were produced on demand, following the preferences of a commissioner. Although none of the watermarks could be identified with certainty, the evidence of the paper particularly in the third quire of the manuscript, together with the prominent appearance of Kress family members in both sections of the manuscripts, point strongly to the possibility that this manuscript was made for a member of this important family. The engraved date of 1619 on the Kress bookplate and a suggested date of the script and paper of the section beginning at f. 72 of c.1600-1610 are evidence of this connection. The first two quires are earlier, dating c. 1540-50, immediately after the Schembart carnival ceased. Corrections and amendments were made soon afterwards as shown by the added leaves and comments (f. 68v (67v)). This and other manuscripts record the participation in the Schembartlauf of a number of members of the Kress family. In 1464, 1465, 1468, and 1495, Hans Kress acted as captain (Hauptmann) of the Schembart, which is pointed out in the text as well as by the coat of arms with a sword leaning to the right on a red ground. Members of the Haller family–related to the Kress family by marriage–are also mentioned among the captains. Moreover, a list with the names of all participants of the 1503 Schembart (f. 44) mentions Jorg Kress. In the third section of the manuscript, we find lists with names of participants of earlier tournaments held in Nuremberg that were not linked to the Schembartlauf, but were apparently added to complete the record of socially important events in the city (f. 82c (81v)); members of the Kress family, once again, are listed among them. Finally, the text concludes by again listing “Sebald Kreß” and “Conrad Kressenstain von der Hallerin geborn” wearing pink for the tournament. The “Kressenstain” title was granted to the family in 1530. The production process of this manuscript is extremely difficult to reconstruct: the collation of the third gathering, the distribution of scribal hands across the second and third quires, and the occurrence of different watermarks throughout all the gatherings is complex. However, it seems quite certain that the first and second quires were produced in one campaign, probably with a couple of blanks left at the end of the second. A few empty leaves have been added to the quire only later, probably around the same time the third gathering was added, as the identical watermarks on the added leaves in the second and the leaves from the third quire imply. The extended account of the riotous carnival of 1507 (ff. 67(66)-68v(67v)) is recorded on a bifolium and single leaf added to the second quire, where the scribe explicitly states that he had kept records of this event 48 years ago in his Schembart Books, which is why he is certain that Sigmund Pfinzing was the captain of the 1507 carnival rather than Sigmund Fuerer. This interesting statement implies that the record in the present manuscript must have been written after 1555, that the scribe was probably an eyewitness of the carnival, and that the scribe was probably known to the commissioner of the added parts of the manuscript, whom he regarded as a trustworthy witness to the chronology of events. It is admittedly possible, but much less likely, that this paragraph was simply copied from a model with identical wording (since why then would the scribe refer to his earlier Schembart Books?). The essential element in the Schembart books is the sequence of masked runners representing the lead figure for each year, the Hauptmann, wearing a mask and a highly decorative costume, and usually identified by coats of arms. A series of 64 stunning colored illustrations, some with gold and silver, is at the center of this precious manuscript. While the details of costume are faithfully repeated in each surviving copy, they are very differently represented. The twofold history of the production of this beautiful manuscript is also mirrored in the illustration. Next to the colorful illustrations of the captains’ costumes, we find 22 additional pen and ink drawings without washes depicting the floats (known as “Holle” or Hells) that were drawn along with the pageant from 1475. These uncolored drawings seem to have been executed by another artist, and, as they have been adjusted to the mise-en-page of the text, probably were added a bit later. In fact, among the approximately 80 preserved manuscript, most of which are kept in public institutions in Germany, there are some that do contain illustrations of the floats as a regular element of the illumination, such as the Getty Research Library copy or Nuremberg Merkel HSS as Los Angeles, Getty Research Library, 2009.M.38 or Nuremberg, Merkel HS 2°241 and 2°271, and those that do not, like the Rosenwald copy in the Library of Congress. Although the design of the costumes and the postures of the figures are very similar in all the Schembart Books, the similarities between this copy and the Washington manuscript are especially striking, and both books may be based upon the same model. The palette of the Washington Schembart is, however, more subdued (and the colors are not as bright and shiny), and overall, the illustrations in our manuscript are consistently higher in quality, evidence that they were most likely not painted by the same artist. The pen and ink drawings of the floats are the work of an experienced illustrator, who trained in the Augsburg-Nuremberg area with artists like Hans Schäufelein, Hans Sebald Beham, or Jörg Breu the Younger, and who transmits the legacy of Albrecht Dürer. The artistic quality of these drawings appears to be of a higher level than the depictions of the floats in most other manuscripts where they were part of the original decoration scheme. As the structure of the text already suggests, the early owners of the manuscript clearly wanted a comprehensive record of the Schembart carnivals and therefore had the depictions of the floats added, probably alongside the additional texts. f. 65: a ship of fools with a backgammon set and the figure of the Lutheran minister, a key in a house, on wheels. Kinser, Samuel. “Presentation and Representation: Carnival at Nuremberg, 1450-1550,” Representations, 13 (1986), pp. 1-41. Sumberg, S. The Nuremberg Schembart Carnival, 1941. Roller, H.-U. Der Nürnberger Schembartlauf. Studium zum Fest-und Maskenwesen des späten Mittelalters, 1965. Exh. Cat. The World from Here, Treasures of the Great Libraries of Los Angeles, ed. by C, Burlingham and B. Whiteman, Los Angeles, 2001-2002, pp. 158ff.